Hi Thanks for showing interest in doing a coaching course with us Paddlesports instructor course with us. In the last week or so we have had a large number of people showing interest in either the Paddlesports instructor course or the Coach award. It has been clear that many of you have not been sure which of the courses would be best for you so I am writing this email with a hope to clarify in a quick way what the difference in the courses is. Either way, if you are at the correct ability you can start either as direct entry course so it could be that you may want to skip the paddlesports Instructor course. If you could let me know which one you would like to do I will then try and collate you with others and make a course happen. We have been very busy of late and if I am honest I have not had enough time to update the courses on our website. I will endeavour to do so however if you are prepared to work with me on setting a date that we can all do I have found that this usually is more successful in making course happen. How Can I get qualified to instruct or assist my canoe club? This is an endorsement recognised by British Canoeing for clubs, organisations and volunteers. For ages 14 plus. Once passed you will be able to help with your club sessions when other coaches are already there. It is organised and completed from within a club using existing coaches for specific sights. Please find more information through this link on how you can get this ticket sorted through your own club. You can enter yourself directly for assessment here or go for a training course. You are assessed in one craft leading a variety of different boats and need to be able to rescue these boats in the open water with up to force three winds and on flat moving rivers. This course used to be the only way to start your ladder into the coaching award (this has now changed- it qualifies you to assist other coaches in sheltered water. It is in review by British Canoeing and change is due to roll out in January 2019. As long as you have 2-star and fsrt you can become qualified in 4 days if you can display demonstration standard of the sills and rescue effectively. The course uses basic coaching theory in application. It is the standard minimum award used in centres up and down the country assisting higher qualified coaches. A great fun course where you will learn more and get a qualification quickly. A fresh new thinking coach education course. Leadership award if pursuing a moderate water or advanced water coach. You need to start the course at a higher standard in paddling. It may take a little longer to achieve the award however you remit will be higher and independent of working with people more experienced. If you would like to be a sheltered water coach you will need to be about 3-star standard and understand the fsrt content within the conditions of ie in open water with up to force three winds and on flat moving rivers. You can if you would like to skip the sheltered water coach stage if you have a moderate or advanced water leader awards (or 4 /5- tar). It will take longer to get qualified with 5 contact days and some work to be done after the 4 training days before assessment. This work is much easier to achieve than the previous level 2 course. The course starts with a 2-day Core theories course. These two days will challenge your brain with some beautiful coaching theory put into place in a practical way. #2 Discipline specific Training (there are 18 different ones of this from the sheltered water t advanced water. The sheltered water ones don’t have prerequisites. Here we put the core theories into place in the discipline of your choice. Again a 2-day training course that includes a more precise practical application of the corse training theories in your chosen waters. So now if you want to chat with me more about this over the phone I am more than happy to help. 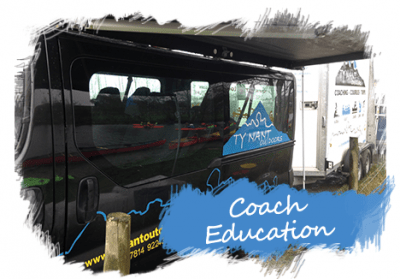 I love running coach education courses, want to help you progress and achieve success. Often a chat on how to do this is the best way. Feel free to email or call for more information.